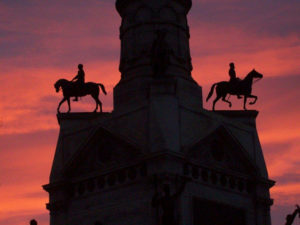 Sunrise at the Soldiers and Sailors monument at the Iowa State Capitol. There’s an effort underway to raise at least $200,000 in private donations to repair and restore some of the monuments on the statehouse grounds. For 25 years, Dikis was the architect in charge of the project to restore the capitol building. He’s now a volunteer on the project to restore some of the 44 statues, fountains and memorial “markers” on the state capitol complex. 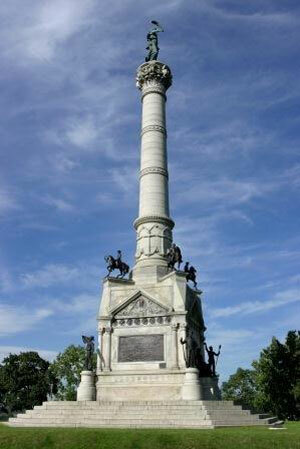 The Soldiers and Sailors monument recognizing Iowans who served in the Civil War sits directly south of the capitol. 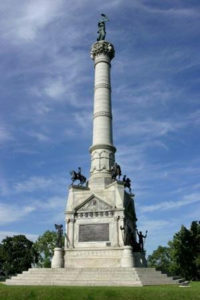 It was completed in 1896 and the elements are taking a toll on the 135-foot-tall monument, according to Dikis. 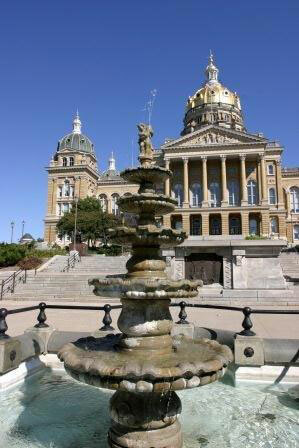 Another monument that needs attention is a water fountain that was installed to celebrate the bicentennial. It’s located on the west steps of the state capitol. 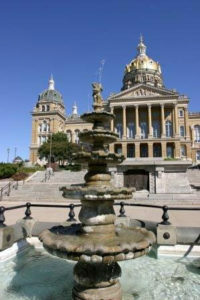 The fountain at the State Capitol building. Memorials on the statehouse grounds that were installed after 1984 have endowment funds which provide for upkeep, but installations before that date need attention according to Dikis. The 2016 legislature set aside up to $100,000 in matching fund for upkeep of these monuments, if the private fundraising effort raises $200,000 by 2018. About $1500 has been raised so far. The fundraiser formally kicks off tonight with a presentation at the “Yankee Doodle Pops” concert on the capitol steps. The mailing address for sending donations is below.